Devices that collect all kinds of fitness and health metrics populated the halls of CES this year, but Sleep Number revealed one of the more intriguing options with its new x12 bed featuring the company's SleepIQ technology. 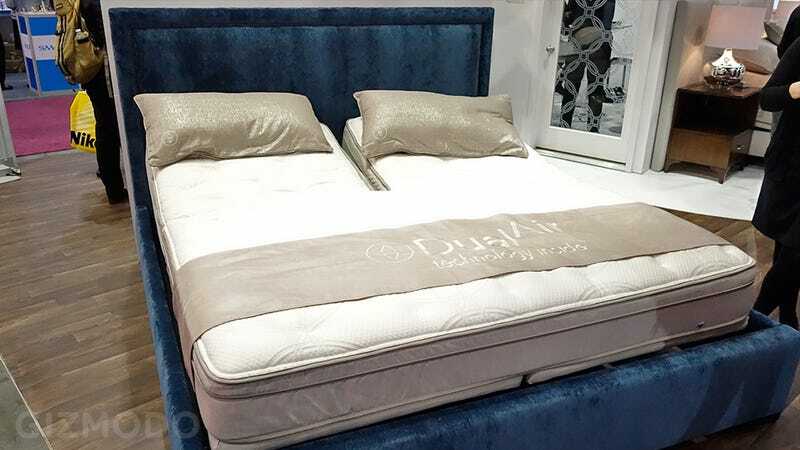 In addition to providing as comfy a night's sleep as possible through a series of inflatable cushions and the company's Sleep Number system, the bed also keeps tabs on your slumber letting you know how restful an evening you had through an accompanying app. The x12 is yet another device requiring a constant connection to your home's Wi-Fi network, but that allows it to upload details about how you slept to your personal account on the company's website. And that data can then be accessed through a phone or tablet, with the specifics laid out in easy to understand graphs and pie charts. So there's no need to remember to sync via a Bluetooth connection, or connect your mobile devices to the bed with a USB cable. The Sleep Number x12 could also be the first bed that comes with its own remote that recognizes speech commands. And that facilitates the one feature that couples are going to appreciate most. At the top of the bed the mattress actually splits in two allowing both sleepers to set a custom angle for sleeping, reading, or watching TV. And in the middle of the night if you happen to wake up to your bedmate snoring like a chainsaw, with a spoken command you can simply ask the x12 bed to activate its snore prevention feature which gently elevates your partners head, clearing their airways so they can breathe through their nose again.